The word judo translates as "gentle way," but you wouldn't know it from the meaty thuds that reverberated through the St. Petersburg gymnasium during Russia's national judo championships on Saturday, Feb. 19. Every now and then, the call to "Finish him!" would issue from the balcony packed with fans and ex-fighters, a crowd with plenty of mangled ears and twice-broken noses. As always, the co-sponsor of the event was the city's elite judo club Yawara-Neva, of which Prime Minister Vladimir Putin  a black belt  is the honorary president. He was unable to attend this year, the organizers explained apologetically, but everyone still seemed aware of his presence. Since 2000, when Putin first became the President of Russia, Yawara-Neva has shot to incredible heights right alongside its general director Arkady Rotenberg, Putin's childhood sparring partner. This month, in the annual ranking of Russia's wealthiest put out by Finans magazine, Rotenberg jumped 17 spots from the previous year to officially join the list of Russia's billionaires. His fortune is now pegged at $1.75 billion, which seems like a lot for a man whose work before Putin took office was mostly confined to running average businesses and promoting judo. But for the members of their St. Petersburg clique, this isn't extraordinary. Most of Rotenberg's fortune has come through his deals with Russia's state-controlled natural-gas monopoly, Gazprom, which is headed by one of Putin's old friends from the St. Petersburg mayor's office. In 2008, Gazprom started selling Rotenberg its subsidiaries, in particular the ones that supply and construct pipelines, and then it started placing huge orders with these companies once they were in Rotenberg's control. In 2009 alone, Rotenberg's firm StroyGazMontazh won 19 of these tenders with Gazprom, sometimes at auctions in which it was the only bidder. One of the main competitors of StroyGazMontazh for these Gazprom tenders is a company controlled by another one of Putin's judo buddies, Gennady Timchenko, the billionaire oil trader (worth $8.9 billion according to the Finans list) who also helped found Yawara-Neva in 1998. Both men deny that their friendship with Putin has helped them make their fortunes. "Acquaintance with a state official of such a high rank has never hurt anyone yet in our country, but it hasn't helped everyone," Rotenberg said in an interview last April with the daily Kommersant. "It is no guarantee." In 2008, Timchenko said reports of his links to Putin were "overblown" and insisted his career was not built on "favors or political connections." For their part, the trainers and champions in Russia's judo circuit are quite proud about being close to Putin, Rotenberg and Gazprom, which was the other sponsor of Saturday's tournament. "We're all in it together," says the event's organizer, Vladimir Gladchenko, gesturing at the banner with the logos of Gazprom and Yawara-Neva that hung above the judo mats. "We have the political support, the financial support, so all we have to do is keep winning tournaments." And with a budget that seems practically limitless, that has come easy so far. Yawara-Neva (the name Yawara refers to a blunt weapon used in martial arts, while Neva is the river that runs through St. Petersburg) has won the European judo championship seven years running, more than any other team in history. It is in many ways a gilded incarnation of the old Soviet judo club where Putin and a handful of his friends trained in the 1960s and '70s, forming a tight circle that seems to have more than its share of distinguished alumni. Besides Rotenberg and his younger brother Boris, who ranked just below his brother on the Finans rich list with a fortune of $1.75 billion, Putin's original judo set included Vasily Shestakov, another co-founder of Yawara-Neva. In 1999, when Putin was first appointed Prime Minister by then President Boris Yeltsin, Shestakov made a sudden break from his life as a judo trainer in St. Petersburg and went into politics, helping create the Unity Party that formed Putin's early base of support. In 2001, that party merged with two others to become United Russia, the political machine that now staffs virtually the entire bureaucracy and every elected chamber in the country. Today Shestakov is a deputy in the federal parliament for Fair Russia, another party loyal to the Kremlin. He is not on Russia's list of billionaires. "But [Putin], as far as I know, replies to the requests of Arkady, Boris, Vasily and the other boys," said Putin's childhood trainer, Anatoly Rakhlin, in an interview with the Izvestia daily in 2007, referring to Shestakov and the Rotenberg brothers. "They are friends, and Putin's character has maintained that healthy camaraderie. He doesn't take the St. Petersburg boys to work with him because of their pretty eyes, but because he trusts people who are tried and true." 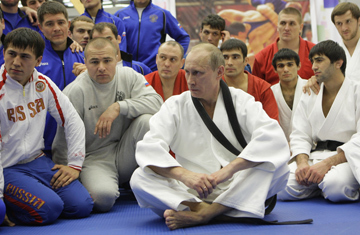 The world of judo is apparently no exception in the ethos of access and influence that dominates Russia. "Clubs without that kind of political support are closing left and right," says Sergei Yudayev, a senior trainer for the Moscow team, as he looks out over the mats where one of his fighters just got creamed. "Yawara is milking its connections," he says bitterly. "Hell, in their place I would do the same." And who can blame him? It may not be the gentle way, but perhaps the surest way to success in Russia lies in having the right connections.